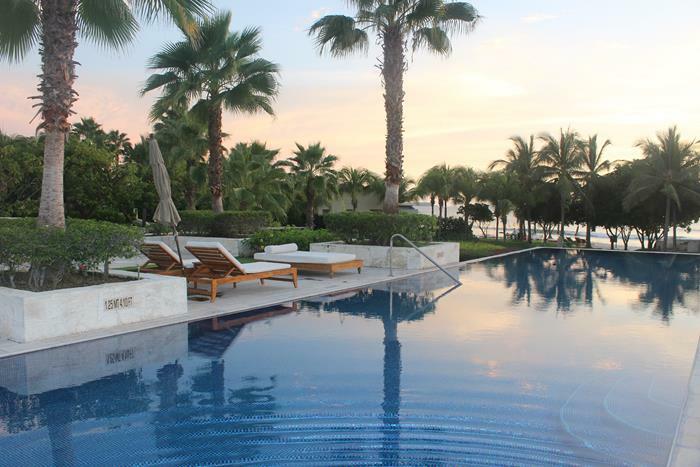 When the temperature starts dipping in New York, that’s the perfect time to escape to Mexico for a tropical getaway. I got married a few weeks ago and wanted to take some time away to enjoy being with my hubby. Some people call it a honeymoon. I call it a working vacation to share another possible vacation destination with Lady and the Blog readers. 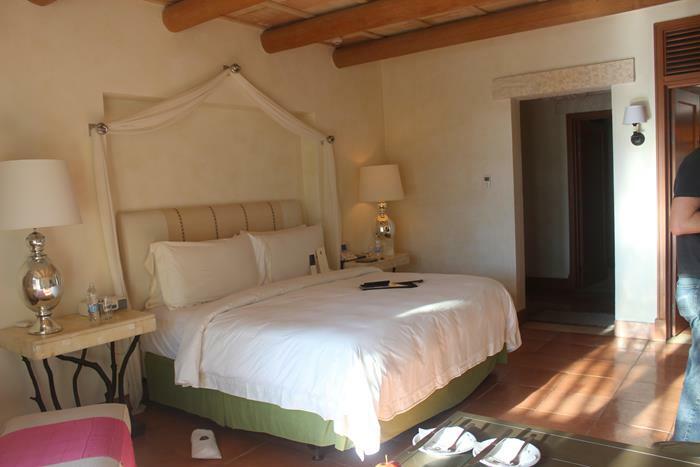 We decided to visit St. Regis Hotel in Punta Mita, Mexico. We landed today around noon and had a chance to walk around before getting dinner at Sea Breeze Restaurant, on the premises. We rented a car (word of advice…..watch out for suspiciously low rental rates online. If it’s too good to be true, it probably is) and drove about 40 minutes on a main road to get to Punta Mita. It was really easy to get to. 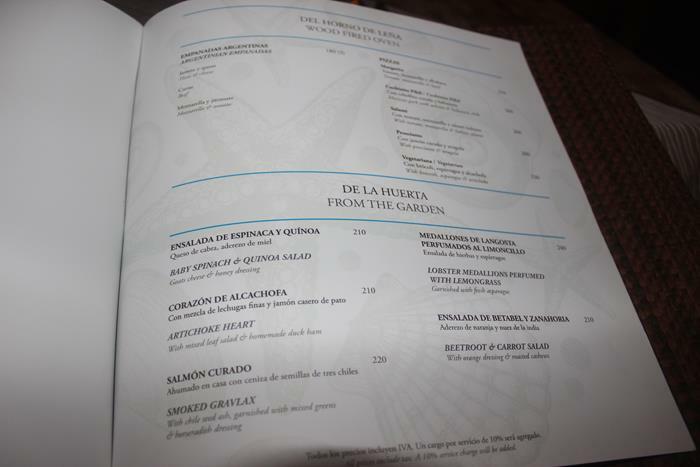 St. Regis is tucked away on a property with other resorts, which means that you get more options for restaurants. 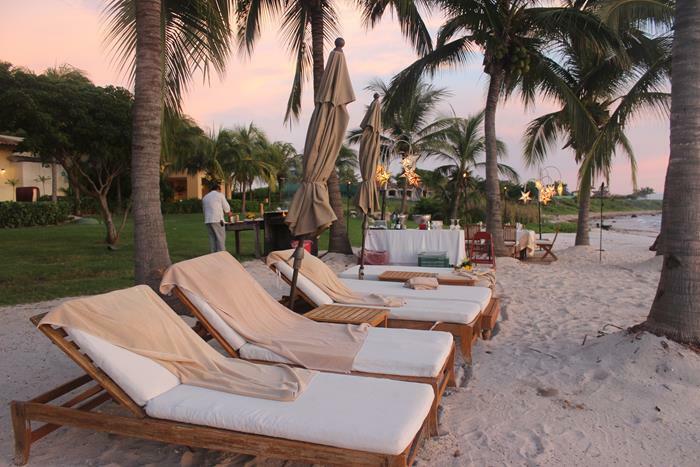 We were welcomed by the staff, who greeted us with refreshing margaritas and chilled towels for the humidity. We were then given the option of where to check-in. We chose comfortable sofas in the lobby. We had out own private entrance from the pathway to our room. Our personal butler greeted us there and let us know that he is available 24/7. I’m worried he doesn’t know the true meaning of what he just committed to with us. Our room is beautiful. It’s tastefully and elegantly decorated to match the warm weather. This is the main bedroom. This walk-in closet may have made my heart skip a beat. 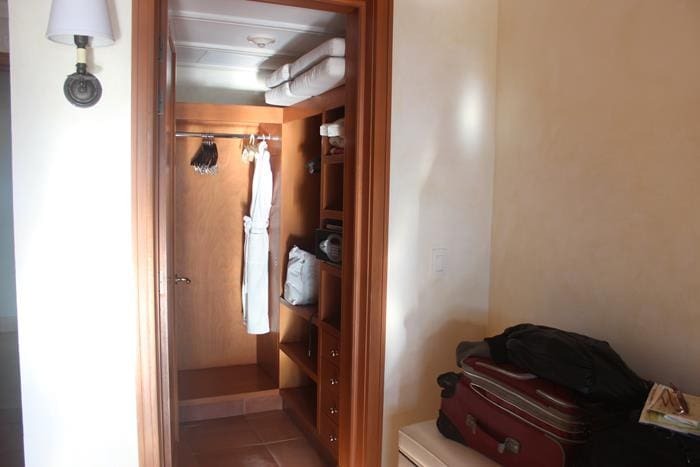 There is tons of room for luggage and for hanging your nicer clothes. 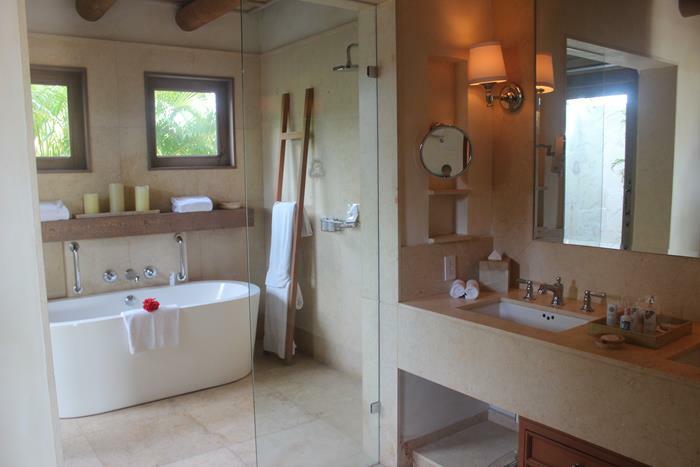 The beautiful bathroom is bigger than most I have seen in NY. 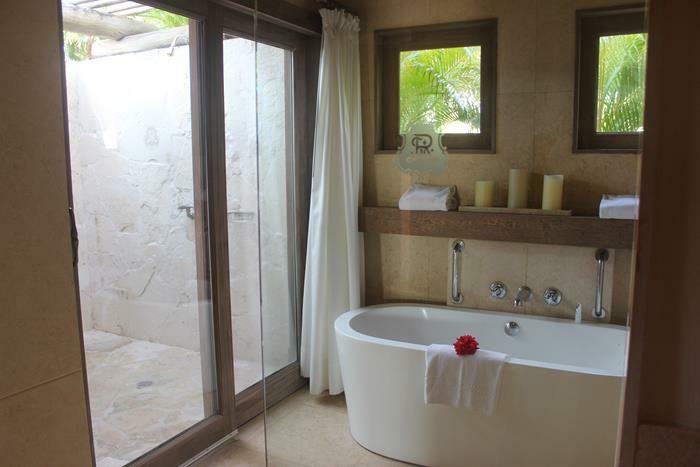 There is an indoor shower and bath and an outdoor shower with a bench, just in case you want to chill out in the shower. Here is the outdoor shower with, of course, complete privacy. We went for a walk before dinner and checked out the various pools. There’ll be more on this later in the week but here is one of their infinity pools. Yes, there’s more than one. There’s also a family pool, for the little ones. We took a walk on the beach. It’s a stone’s throw away from the hotel. The sand is everything you can imagine paradise to be. It’s warm and so fine. I dipped my toes in the water and cannot wait to jump in tomorrow. The water is super warm and very calm. If you come with kids, they’re sure to enjoy swimming in the shallow water. 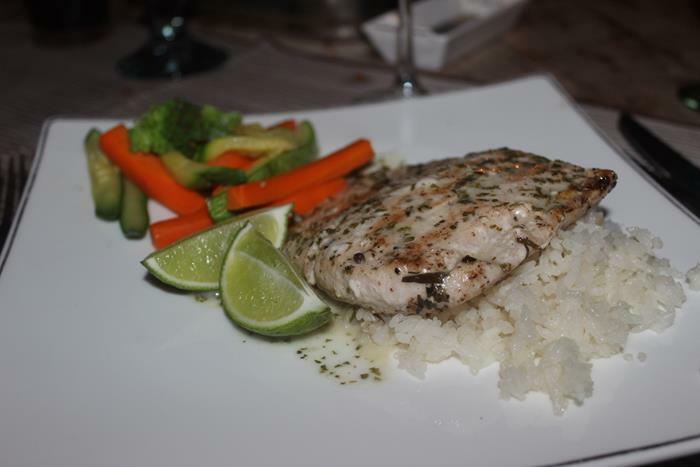 A family ordered a private dinner on the beach, cooked by one of the chefs. If you’ve had enough of seeing other people, you might want to go this route. What I loved from the moment I entered the hotel is that it was so serene. Even though it’s not peak season, it didn’t feel over-crowded with guests, though I did see other people. 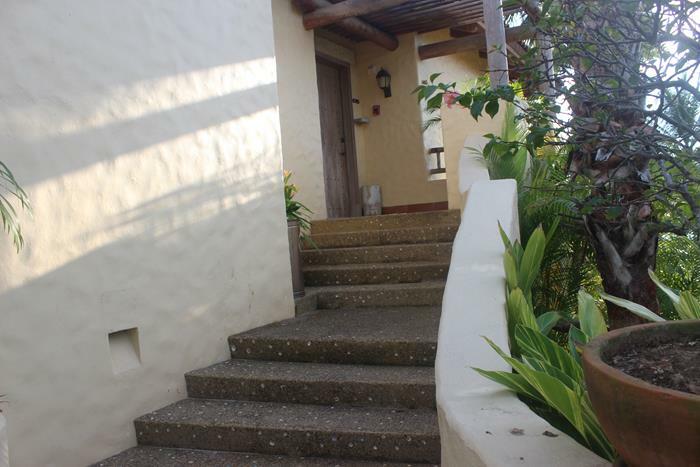 The property is sprawling so you can be as secluded as you want to be. We ate dinner at one of the many restaurants on the property, Sea Breeze. The food was beyond delicious. I had the Catch Of the Day. It was perfectly seasoned and the perfect portion that left me feeling satisfied but not overly stuffed. 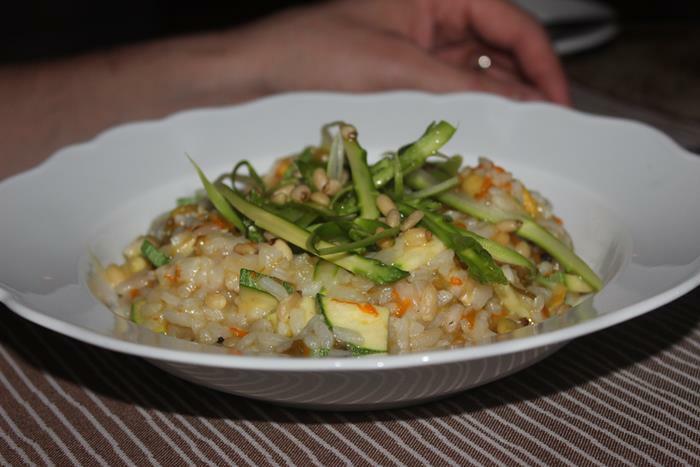 My hubby had the risotto, which was equally yummy. Our first half day at the St. Regis went so well. We’re a bit exhausted from flying and are hoping to get a good rest before breakfast at Sea Breeze tomorrow morning. First on the agenda is a full tour of this palatial resort. I’ll be keeping my eyes out for if it’s appropriate for families. I’m here for 4 days and will be blogging live so stay tuned! 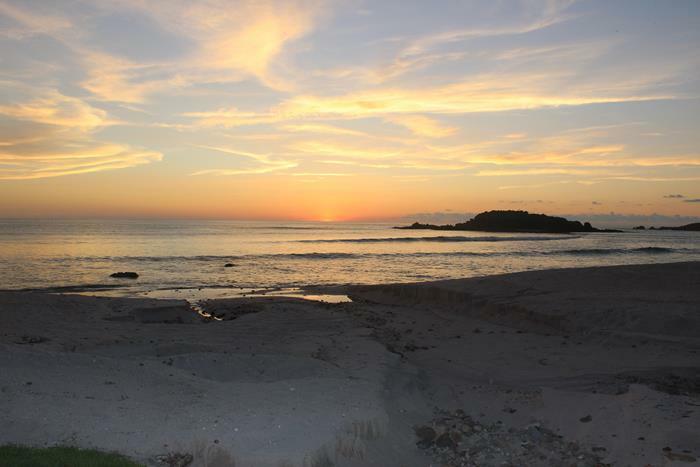 For more information on the St. Regis Punta Mita, click here. Disclaimer: Portions of this trip are complimentary. All opinions are 100% my own. have a fab time…looks perfect!